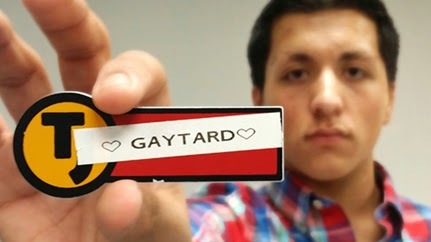 A gay South Dakota teen says his boss at Taco John's forced him to wear a "Gaytard" name tag at work. The American Civil Liberties Union (ACLU) is representing Tyler Brandt, 16, in his discrimination case against Taco John's International for his alleged mistreatment at the Yankton, South Dakota fast-food joint. "The night manager called me into the office and handed me a name tag he'd just made. He said, 'Wear this!' with a huge grin on his face like he was really proud of himself. I looked at the name tag and saw that it read 'Gaytard' with little hearts on either side of the word," Tyler wrote on the ACLU site. "My mom raised me to be respectful and polite, and I didn't want to lose my job. So I put the name tag on and then said, 'OK, can I take it off now?' He just laughed at me and told me to leave it on." What's wrong with calling someone a 'gaytard'? Usually when muttering under my breath while reading the comments section of Gaytard News Gay Star News. Some gays are gaytards, get over it, dude.